Here comes christmas time ! _Standard closure during Christmas holidays from 24 December to 3 January inclusive. For any inquiry, please complete the contact form or leave us a message on the phone at 04.94.55.55.94. We will contact you shortly. However, the 2016 Reservations are always possible online! _ Last days to take advantage of the EARLY BOOKING -10% discount so hurry and book before December 31st. A booking option is the guarantee to get your place under the sun! _ The Best Pastry Contest is open! Go ahead and perform one of the 13 Desserts of Provence: traditional Pump Oil … We will post on our Facebook page the most appetizing and most beautiful pump and its maker will be offered a gift basket filled with local products! It's almost Christmas ! 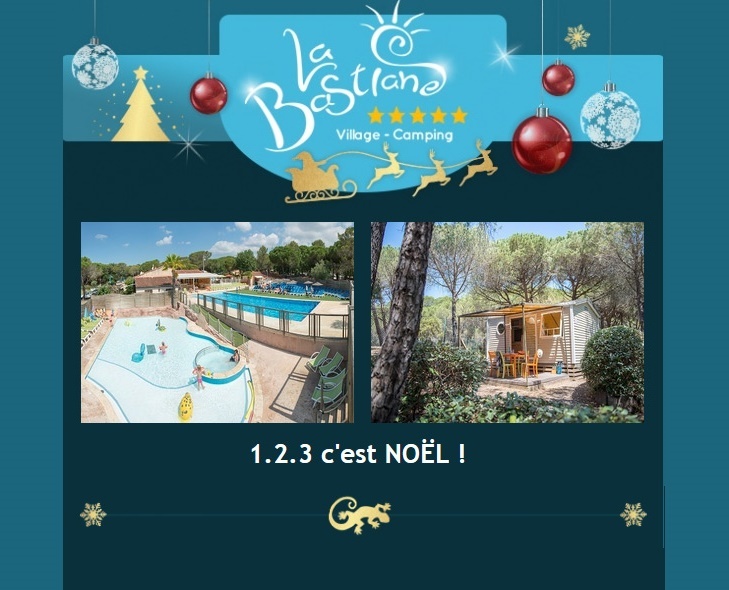 Yelloh Village La Bastiane wishes all its campers excellent Year- end holidays!! Do not miss the latest news with our newsletter in December. Early Booking -10% is valid until December 31st, 2015 .Take advantage of this offer and book your holiday in an authentic site, nestled in the heart of a family and friendly setting. Casual and natural atmosphere for sunny break. Rent a luxury cottage with air conditioning and TV.